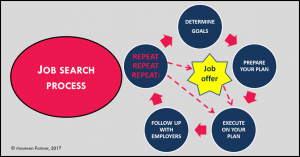 If you are in job transition and are feeling uneasy about your progress, you might consider an age-old proven process. The image in this article explains it perfectly. The first step is executing on your plan—flawlessly. This means that you have a regular follow-up system and diligently follow it. The second is following up directly with those employers you’ve already connected or interviewed with. Follow up with each employer at least seven times. Repeat as needed until you receive a job offer that satisfies you. Georgia was visiting Canada and had a work visa. A bright and credentialed technology professional, we had met for coffee casually to discuss job opportunities in my city. Eleven months later, and four weeks before her visa was to expire, she contacted me in a panic. In order for her to remain in Canada, she would need to have a written job offer submitted to the Department of Immigration. I had been sure she had already landed a job! Although Georgia had 11 interviews in 12 months, she had not received a job offer. Georgia spent seven frenzied days calling the employers she had interviewed with over the previous 12 months. It paid off. She received a written job offer on the fifth day! You might claim that Georgia was simply lucky. I believe Georgia simply executed on a proven strategy. After 14 months in this initial job, Georgia was recruited to a Fortune 100 company in the city as a technical project manager. Perhaps you are unsure how to follow up with a decision maker. Don’t let this stand in your way of a critical step in the process. Here is a script you can customize for your own situation. Thank you for meeting with me last week to discuss the role of VP Business Development. As you know, I am keenly interested in your organization. The business development that I have been able to generate for my current employer is exponential, culminating recently in a $25M+ deal that will see important business sectors invest their businesses in our city. I can do the same for you. Because of the positive feedback I have garnered relative to my interest in this role, it occurred to me that it might be helpful for you to have an updated copy of my resume. Although not mentioned in my application letter, over the last 3 months, I have been repeatedly recruited by a number of firms, including PJ Mortgage, Atlantic Financial and Northern Equity. You can customize this script as required. Following up with employers has the best ROTI (return on time invested) in any 21st century job strategy.